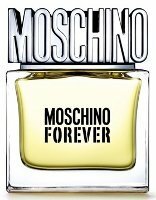 Moschino will launch Moschino Forever, a new aromatic fougère fragrance for men, in March. Moschino Forever was developed by perfumer Nathalie Lorson; the notes include kumquat, bergamot, star anise, clary sage, tonka bean, black pepper, vetiver, musk and sandalwood. The cap is a bit much. It also looks as if it would be damaged easily. I can just about see the ad copy with that cap as the “bling” on the model, maybe as one of those knuckle rings across the whole hand (not sure what the street name for those are. . .), or even better: a grinning model with the cap as his *bling* in his teeth! In any case, do you think urban thug is what they’re going for, because that’s what I see?! It’s a bit much for me too. But I’m not a huge Moschino fan either. I think the cap is tacky but cute. It seems like all men’s fragrances have these exact notes. It really does seem that way…wonder what percentage of new men’s fragrances are aromatic fougeres lately. Maybe about the same as the percentage of new women’s scents that are fruity florals? But OMG, I’v been looking for a fruity floral everywhere! HOW FABU! LOVE THAT BOTTLE! SO MUCH! Sounds like a pretty good scent too… will definitely have to try! The cap is way too tacky and bling bling.This I can see being something a teenage boy might like based on the bottle and of course the ad that will most likely have a guy with a knuckle ring.Oh no I can see the ad now.This was a bad move for them.Never liked their fragrances. for me it is a very pleasant perfume, masculine and fresh. Robin, it would be a good idea if you give us a detailed review on this perfume.